A trip through the shadowy, surreal world of an academic book mill. If you’re an academic (or were once an aspiring academic), you may have once received an email just like the one I got at 6:10 on a sunny morning last August. 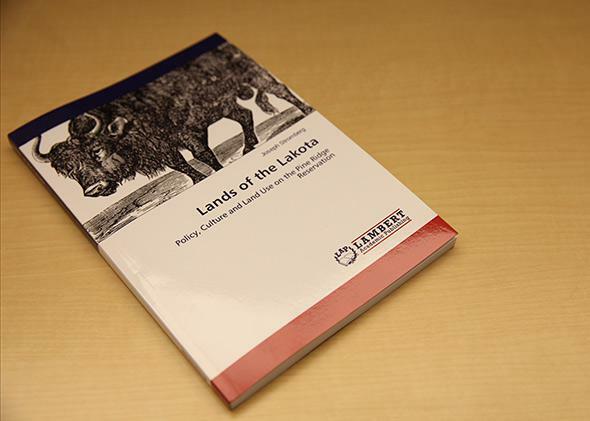 “As stated by the Washington University in St. Louis’s electronic repository, you authored the work entitled ‘Lands of the Lakota Policy Culture and Land Use on the Pine Ridge Reservation’ in the framework of your postgraduate degree,” Karen Holmes, an acquisition editor at LAP Lambert Academic Publishing, told me. She added that she worked for a “top international publishing group” and was interested in publishing my work as a book. The email was slightly better quality than spam—she’d gotten my school’s name and undergraduate thesis title right, with the exception of a missing colon—so I hesitated ever so briefly before deleting it. On a whim, I Googled her company’s name. The first page of results contained links like “Lambert Academic Publishing: A Must to Avoid,” “Why You Shouldn’t Publish With Lap Lambert, German Publishing House,” and “Lambert Academic Publishing (or How Not to Publish Your Thesis).” The bloggers and academics who’d written these posts had gotten emails virtually identical to mine and wrote about how the company obtained the rights to tens of thousands of theses, dissertations, and other unpublished works for essentially nothing; sold copies of them as books to unsuspecting online buyers (who assumed they were purchasing proofed, edited work); and kept essentially 100 percent of the proceeds. LAP Lambert, I learned, is the print equivalent of a content farm: a clearinghouse for texts that generate tiny amounts of revenue simply by turning up in search and appearing to be legitimate, published works. So, naturally, I replied to Holmes, telling her I was interested in hearing more. I was struck with a zany idea: to sell away the rights to my thesis in exchange for the sheer pleasure of documenting and sharing the experience. For a brief time, in college, I’d thought about going into academics, but I’m now a working journalist, so my thesis isn’t doing a whole lot for me. It could be put to better use, I reasoned, as a way of exploring the blend of high and low tech that fueled this strange industry. Holmes replied with enthusiasm, telling me that if I was interested, I should send her a PDF of my thesis and she’d let me know if they wanted to publish it. I did so, and for four days, I waited with bated breath. Then: jubilation. “We assessed your work with great pleasure and confirm our interest in publishing it,” Holmes told me, attaching the terms and conditions of the sale, along with formatting guidelines. The contract told me—as I’d already learned from the blog posts—that I’d transfer the exclusive right to print my thesis to AV Akademikerverlag GmbH & Co. KG, the German company that owned LAP Lambert. (I could still let people download the thesis digitally, if I wasn’t making a profit.) They’d pay for all publishing costs, and I’d get 12 percent of the book’s royalties, but only if they cleared 50 euros per month for a calendar year—otherwise, I’d just get credit to use in buying other LAP Lambert books. I was responsible for making sure the text didn’t contain plagiarism and that I had the right to sell it in the first place. They would set the retail price and could suggest corrections to any grammar or spelling errors they came across. I clicked on the link she’d sent, digitally signed the agreement, and was told to start uploading my thesis. At this point, I did a bit more research into LAP Lambert and found that it’s really just the tip of the book-mill iceberg. Both it and AV Akademikerverlag GmbH & Co. KG are part of an enormous German publishing group called VDM that publishes 78 imprints and 27 subsidiary houses in English, French, Spanish, German, Italian, and Russian, and plans to soon open up shop in Turkey and China. It has satellite offices in Latvia and Uruguay, but the majority of its English- and French-speaking staff are based in the tax haven of Mauritius, off the coast of Madagascar. Founded in Düsseldorf, Germany, in 2002 by a man named Dr. Wolfgang Philipp Müller, the company is notorious for using on-demand printing technology to package all sorts of strange content in book form and selling it online. The company declines to release financial data but claims to publish 50,000 books every month, making it, by its own accounting, one of the largest book publishers in the world. How can it possibly churn out this many titles? Although a huge number are academic texts, hundreds of thousands result from an even stranger process: They’re built entirely from text copied from Wikipedia articles. On VDM’s own online bookstore, Morebooks.de, the listings for books like Tidal Power, Period (number), and Swimming Pool Sanitation (published by VDM’s Alphascript and Betascript imprints) directly acknowledge this fact. Thousands are listed for sale on Amazon, all with the same cover design (albeit with different stock photos swapped in) and the same three names (Frederic P. Miller, Agnes F. Vandome, and John McBrewster) listed as the “authors.” Some go for as much as $100. Though the practice is technically legal—most Wikipedia content is published under licenses that allow it to be reproduced—critics say that it’s unethical and deceitful for the company to profit from content freely available on the Web. That description, of course, also fits most of the academic books published by LAP Lambert. (A PDF of my thesis, for instance, was already published on my college’s website.) “The basic idea is that they bulk email people who have written a master’s or Ph.D. thesis and invite them to publish it,” Matt Hodgkinson, an editor for the Public Library of Science who’s written about LAP Lambert on his personal blog, told me. “There’s no selection process, there’s no editing—the thesis is essentially published unchanged but called a book.” Ohm admitted this without hesitation. “The editors just do a quick check,” he said. “We don’t do proofreading.” (Karen Holmes declined to comment on LAP Lambert’s editing practices for this article.) The company presumes that because most books have met the standards of various universities, they’re already publication-quality. By stockpiling the rights to a huge variety of works, automating the entire publishing process, and printing books only if they’re purchased at marked-up prices, the company can cut overhead to a negligible amount and generate significant profits, even if they sell few copies. Some of the blog posts were also filled with angry comments from customers, who bought Lambert books thinking they were edited, full-length works, only to discover they were amateur-quality and riddled with typos. (One 72-page tome, for instance, is titled “Lease Financing; Hindrarnces to adoption By Business Enterprisses.”) Most infuriating for them is the fact that, in most cases, the same content is available to download for free from university repositories. Moreover, Hodgkinson and other critics point out, it’s simple for an author to upload an e-book to one of a number of open-source sites if she wants to make it widely available. If the author’s hell-bent on a hard copy, there are self-publishing services that offer much better terms (in terms of the percentage of royalties paid to the author) and allow authors to retain copyright. When I mentioned these charges to Ohm, he noted that a handful of discontented authors are inevitable when you publish tens of thousands of works and highlighted his company’s chief selling point. “We promise the authors that they don’t have to pay anything for their publication,” he said. “This has been our idea from the start.” Technically, he’s right. If I want to pay nothing to turn my thesis into a “book”—albeit only in a metaphorical sense, unless someone actually buys it—LAP Lambert is the way to go. But plenty of people consider the company’s strategy predatory—and in his research, Hodgkinson uncovered a curious pattern that lends credence to this view. He found that the Facebook profile of Kevin Woodmann, one of the acquisition editors, featured a “low budget royalty free” stock photo entitled “Confident middle aged man sitting and smiling in front of white background.” (The photo has since been removed from the Facebook profile.) Other acquisition editors used stock photos for profile pictures as well. Upon logging in to LAP Lambert’s online publishing platform to upload my work, I was greeted with an utterly cryptic message. “Dear valued author, we would like to share some exciting news with you,” it read. “The AV Akademikerverlag GmbH & Co. KG will change its name into OmniScriptum GmbH & Co. KG. This move reflects our ongoing endeavor to open ourselves internationally and beyond the academic borders.” The company’s excitement was contagious. I proceeded through the publishing process, filling in fields for the title, subtitle, and summary that would appear on the front and back cover. The actual cover design was predetermined—blue and white, with an unsightly red stripe across the bottom—and I was forced to choose a piece of cover art from a gallery of a few hundred clip-art images and stock photos. I searched for anything that might be even slightly relevant to my thesis, like a picture of a prairie (it was about how federal land policies affected a Native American reservation in South Dakota), but found nothing. In the end, I chose a black-and-white drawing of a bison, with sad, cartoonish eyes. The cover complete, I was instructed to upload a PDF of the book itself, with guidelines for the page size, table of contents, page numbers, and other design elements. Reformatting the original Word document took some time, and I did so with the strange awareness that, in all likelihood, no one would ever see it printed on paper unless I bought a copy myself. Upon submitting the text, I got an email from Holmes, telling me it would soon undergo a “technical verification.” My book was assigned its own unique ISBN: 978-3-659-46676-2. I had finally achieved my lifetime dream of becoming a published author. About a month later, I heard from Holmes again. My book was on the verge of being published, and I had a very special opportunity: If I acted now, I could buy multiple copies of it at deeply discounted prices. The standard price for the 128-page book was 49.90 euro (about $68), but I could get five copies for 32.90 euro each, or 20 copies for 29.90 euro each, and if I was prepared to buy 200 copies, I could have each for 22.90 euro. As part of the prepublication deal, if I bought a number of copies at any one of these levels, all future retail shoppers would get to purchase the book at the same price I’d paid, even if they bought just a single copy. LAP Lambert’s real plan finally became clear: They make money not by selling arcane tomes to readers, but by selling the books back to their authors after they’ve already signed away the rights. The company isn’t technically a vanity press, because it doesn’t charge authors publishing fees, but its model is essentially the same. Getting an author to buy tons of copies (presumably to give or sell to family and friends) guarantees enough profit that it’s willing to sell the books at a lower price. I briefly considered buying a single copy, but ultimately declined, partly out of principle, and partly because I’m cheap. Over the next two weeks, I got three more emails from Holmes pressuring me to buy, each more aggressive than the last. She used several strategies: guilt (“We agreed to provide you free ISBN, free cataloguing of your book in thousands of bookstores, free book cover, market coverage, support and assistance. We are now offering you the opportunity to support your project.”); optimism (“You can also purchase some copies and market them in your locality or maybe even sell them at your own price, thus not only generating profit, but also getting to know your target audience and perhaps establishing valuable contacts.”); and finally, hostility (“We would have thought that you would have at least liked to have some copies of your new published book and that is why proposed this offer to you in the first place. 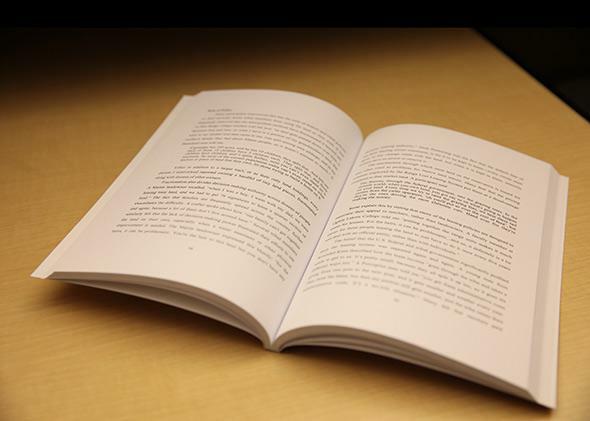 Maybe you have not realized the importance of having some printed copies of your book in hand?”). Each warned that my window of opportunity to take advantage of the deal was rapidly closing, but I declined repeatedly. Soon afterward, I finally got the news I’d been waiting for: My book was published. I found it for sale at VDM’s online bookstore, surrounded by thousands of other books wrapped in identical covers with surreal stock photos or clip art. (At latest count, 84,253 have been published by LAP Lambert alone.) I spent an inordinate amount of time browsing them and wondering about the authors. Why did they sell their books to this strange company? There was one sucker, though. Against my better judgment, I finally bought a copy shortly before finishing this article, finding the best price on Amazon ($61.20, plus free shipping with Prime). Somewhere, one of Amazon’s on-demand printing presses came to life and churned out all 128 pages of my thesis, binding them together between an ugly blue-and-white cover. In two days, the familiar brown Amazon box arrived at my house.